Following the successful 'Reactivated' Turnstyle show with original members Adem K, PJ and Dean Davies in 2010, Turnstyle are back with all four members from the 1998-2000 line up completed by Todd Griffiths. 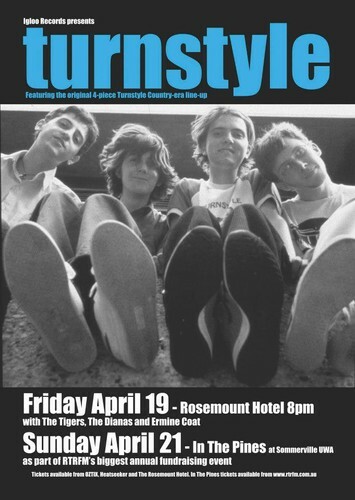 At the behest of RTRFM, Turnstyle have accepted a spot on this year's In The Pines 20th Anniversary Edition as well as adding an exclusive sideshow on April 19, 2013 at the Rosemount Hotel. Turnstyle will perform a marathon set covering their earlier releases Itcheekneesonchee and Seasides along with everything they can humanly recreate from Turnstyle Country. Turnstyle Country was one of the most successful independent releases to come out of Perth in the late 90s and to the band’s surprise spawned an ARIA top 20 hit with the single Spray Water On The Stereo. Turnstyle are remembered for their quirky, angular indie rock, using cheap keyboards and for the time, unconventional recording techniques. This show will thrill old fans and surprise new ears, dismissing stale conceptions of 90s alternative rock and revealing Turnstyle as a band who’s style and approach is still relevant 13 years on.